the right to direct the use of the identified asset (as described in paragraphs B24–B30). B10 If the customer has the right to control the use of an identified asset for only a portion of the term of the contract, the contract contains a lease for that portion of the term. B11 A contract to receive goods or services may be entered into by a joint arrangement, or on behalf of a joint arrangement, as defined in IFRS 11 Joint Arrangements. In this case, the joint arrangement is considered to be the customer in the contract. Accordingly, in assessing whether such a contract contains a lease, an entity shall assess whether the joint arrangement has the right to control the use of an identified asset throughout the period of use. B12 An entity shall assess whether a contract contains a lease for each potential separate lease component. Refer to paragraph B32 for guidance on separate lease components. B13 An asset is typically identified by being explicitly specified in a contract. However, an asset can also be identified by being implicitly specified at the time that the asset is made available for use by the customer. the supplier would benefit economically from the exercise of its right to substitute the asset (ie the economic benefits associated with substituting the asset are expected to exceed the costs associated with substituting the asset). B15 If the supplier has a right or an obligation to substitute the asset only on or after either a particular date or the occurrence of a specified event, the supplier’s substitution right is not substantive because the supplier does not have the practical ability to substitute alternative assets throughout the period of use. a substantial difference between the market price of the asset during the period of use, and the market price considered likely at inception of the contract. B17 If the asset is located at the customer’s premises or elsewhere, the costs associated with substitution are generally higher than when located at the supplier’s premises and, therefore, are more likely to exceed the benefits associated with substituting the asset. B18 The supplier’s right or obligation to substitute the asset for repairs and maintenance, if the asset is not operating properly or if a technical upgrade becomes available does not preclude the customer from having the right to use an identified asset. B19 If the customer cannot readily determine whether the supplier has a substantive substitution right, the customer shall presume that any substitution right is not substantive. B20 A capacity portion of an asset is an identified asset if it is physically distinct (for example, a floor of a building). A capacity or other portion of an asset that is not physically distinct (for example, a capacity portion of a fibre optic cable) is not an identified asset, unless it represents substantially all of the capacity of the asset and thereby provides the customer with the right to obtain substantially all of the economic benefits from use of the asset. B21 To control the use of an identified asset, a customer is required to have the right to obtain substantially all of the economic benefits from use of the asset throughout the period of use (for example, by having exclusive use of the asset throughout that period). A customer can obtain economic benefits from use of an asset directly or indirectly in many ways, such as by using, holding or sub-leasing the asset. The economic benefits from use of an asset include its primary output and by-products (including potential cash flows derived from these items), and other economic benefits from using the asset that could be realised from a commercial transaction with a third party. if a contract limits the use of a motor vehicle to only one particular territory during the period of use, an entity shall consider only the economic benefits from use of the motor vehicle within that territory, and not beyond. if a contract specifies that a customer can drive a motor vehicle only up to a particular number of miles during the period of use, an entity shall consider only the economic benefits from use of the motor vehicle for the permitted mileage, and not beyond. B23 If a contract requires a customer to pay the supplier or another party a portion of the cash flows derived from use of an asset as consideration, those cash flows paid as consideration shall be considered to be part of the economic benefits that the customer obtains from use of the asset. For example, if the customer is required to pay the supplier a percentage of sales from use of retail space as consideration for that use, that requirement does not prevent the customer from having the right to obtain substantially all of the economic benefits from use of the retail space. This is because the cash flows arising from those sales are considered to be economic benefits that the customer obtains from use of the retail space, a portion of which it then pays to the supplier as consideration for the right to use that space. B25 A customer has the right to direct how and for what purpose the asset is used if, within the scope of its right of use defined in the contract, it can change how and for what purpose the asset is used throughout the period of use. In making this assessment, an entity considers the decision-making rights that are most relevant to changing how and for what purpose the asset is used throughout the period of use. Decision-making rights are relevant when they affect the economic benefits to be derived from use. The decision-making rights that are most relevant are likely to be different for different contracts, depending on the nature of the asset and the terms and conditions of the contract. B27 Examples of decision-making rights that do not grant the right to change how and for what purpose the asset is used include rights that are limited to operating or maintaining the asset. Such rights can be held by the customer or the supplier. Although rights such as those to operate or maintain an asset are often essential to the efficient use of an asset, they are not rights to direct how and for what purpose the asset is used and are often dependent on the decisions about how and for what purpose the asset is used. However, rights to operate an asset may grant the customer the right to direct the use of the asset if the relevant decisions about how and for what purpose the asset is used are predetermined (see paragraph B24(b)(i)). B28 The relevant decisions about how and for what purpose the asset is used can be predetermined in a number of ways. For example, the relevant decisions can be predetermined by the design of the asset or by contractual restrictions on the use of the asset. B29 In assessing whether a customer has the right to direct the use of an asset, an entity shall consider only rights to make decisions about the use of the asset during the period of use, unless the customer designed the asset (or specific aspects of the asset) as described in paragraph B24(b)(ii). Consequently, unless the conditions in paragraph B24(b)(ii) exist, an entity shall not consider decisions that are predetermined before the period of use. For example, if a customer is able only to specify the output of an asset before the period of use, the customer does not have the right to direct the use of that asset. The ability to specify the output in a contract before the period of use, without any other decision-making rights relating to the use of the asset, gives a customer the same rights as any customer that purchases goods or services. 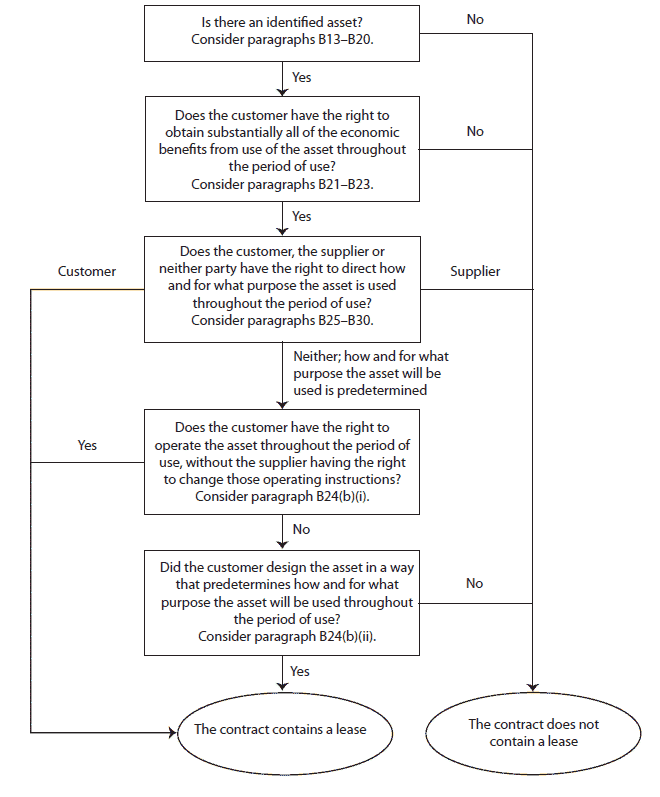 B31 The following flowchart may assist entities in making the assessment of whether a contract is, or contains, a lease.